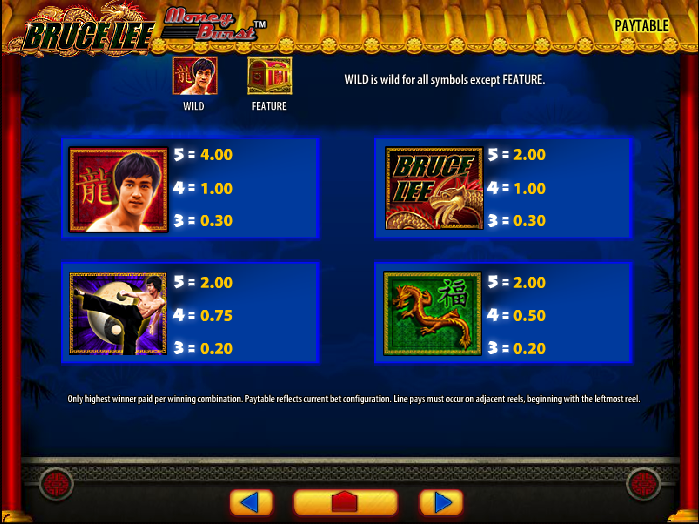 Slots fans familiar with the original Bruce Lee online slot from WMS Gaming will be pleased to hear that there is now a sequel; it’s called Bruce Lee: Dragon’s Tale and the good news is that it retains the split reel feature of the original but adds some impressive improvements. As you can see from the screenshot above there is one main set of reels and there smaller sets; twenty paylines on each set adds up to eighty in total and some explanation of how the game works is probably necessary. 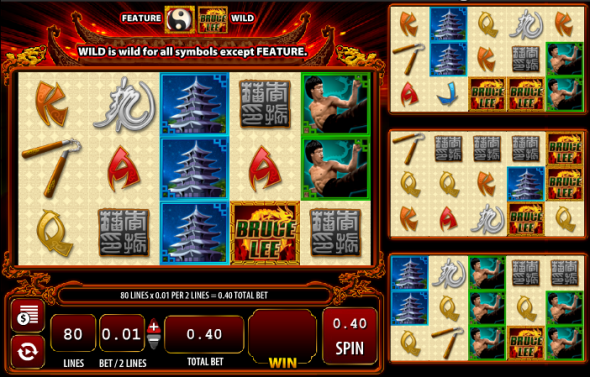 All the reels operate independently and can generate wins without any involvement from the others but there’s one feature which mixes things up a bit – if the Yin Yang bonus symbol or Bruce Lee wild symbol land on the main reel, that symbol will transfer to the corresponding positions on the other reels. This means that there are four times the number of wilds and bonus symbols to create winning possibilities. The game’s other symbols are some playing card icons of a Chinese design, nunchucks, some Chinese script, a temple and two views of Bruce Lee himself. The extra good news is that more free spins are available if you can land three or more scatter symbols. There’s very little advice we can offer for this slot – the 4 x 20 paylines are fixed so we say just play it and have fun watching the symbols fly from one reel to another and listening to the Chinese music. This is an excellent slot – it builds on the original and offers improvements in terms of quality, features and gameplay. It’s another great slot-based tribute to the great man.